Looking for a casual party game to play amongst friends? 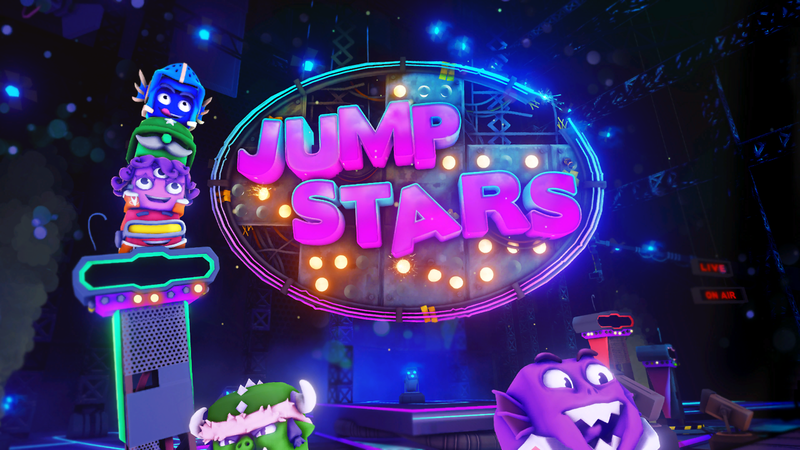 Jamit Games and Curve Digital believe they have you covered with their new platformer, Jump Stars. Is this a party worth attending? Time to find out in our review. Jump Stars may be an indie game, but it has fairly high production values (likely a by-product of being created in the Unreal Engine). This is evident in its opening cinematic, where we meet the sinister “game show” host who is attempting to introduce the premise, but experiencing technical difficulties. It isn’t too long before the façade is dropped, and the truth is revealed – you aren’t playing for some fabulous prize, just merely your life! That’s about as far as exposition goes, though; other than providing amusing commentary and popping in on the side of the screen from time to time, the host stays out of your way. The Unreal Engine is one of the most powerful game engines out there, and Jump Stars appears to be well-tuned to the engine. The PS4 hardly broke a sweat during our time with the game, staying buttery-smooth no matter the action taking place on screen. Levels and characters are colorful and friendly, even if there is technically brutal cube-on-cube life-or-death action going on every single round. You (and at least one other gamer) play as a Cubee, multi-color cosplaying cubes that dress up as everything from pirates to aliens, robots to monsters, and everything in between. Names are randomized every game, while you can choose what theme and character to play as before each tournament. Let me be clear about one thing: multiplayer is required to even play the tutorial. There is no single player component. This is strictly a party game. Don’t have friends to play with in real life? Well, there’s no online component, either, so you’d be out of luck in that case. Controls are dead-simple in Jump Stars. Move with the left stick, jump with the Cross button, punch left and right with L2 and R2, and punch up with L1 or R1. Some levels have you jumping down through platforms, by just pressing down on the left stick. There’s not much else to it. If you’ve played any sort of 2D platformer in the last couple of decades, you’ll pick this right up. If there’s one game that Jump Stars constantly reminded me of, it’s LittleBigPlanet. Indeed, a lot of these level types seen in this game have been done, and perhaps done almost as well, in a fan-made level in LBP 1/2/3. But here, in the Unreal Engine, the platforming physics used are much more solid. There’s none of that slightly-floaty platforming that takes some getting used to in LBP. Instead, the jumping is somewhere between Sonic the Hedgehog and Super Meatboy. You’ll see all that Jump Stars has to offer in one session; likely within an hour or so. There is a small number of different game types, such as jumping over an obstacle as it swings around the level faster and faster, or jumping up an infinite set of platforms as they move downwards a la Doodle Jump. Your group of two to four players will go from round to round until enough points have been earned to unlock “The Gauntlet,” a final level where you simply run to the right, away from a deadly grid. The level moves only as quickly as it needs to keep up with the current leader. Each level other than The Gauntlet features special platforms that light up in a random color. Stepping on platforms lighting up in your team’s color earns you team score, which isn’t really explained in the game. Indeed, many of the game’s scoring rules aren’t really explained, and there will be times that a player may win a round even if they died first. If you want to call the shots for what level is played, you can create a custom playlist of up to nine levels, though you cannot save a particular playlist to come back to it later. Just when you think you’re getting the hang of the game, it’ll end. Longevity might be a problem with Jump Stars, but played in small doses, this could be a good warm-up game or something to play if you don’t have much time to dedicate. The Trophy list is also quite easy, and achieving a platinum will be a walk in the park for any trophy hunters out there. Jump Stars is a nice, cheap diversion if you have a couple of friends to play with. Unlike almost every other game out there, you cannot play single player. There are also just a handful of game modes to choose from. It’s a party game you might come back to when the mood strikes. The fake game show announcer with dual personalities injects some, well, personality into the game, and the characters are amusing to play with. There’s not a ton of content, and multiplayer is required, but $9.99 ($7.99 for PlayStation Plus members) seems like a fair asking price for Jump Stars. Review code for Jump Stars provided by publisher. Reviewed on PS4 Pro. For more information on scoring, please read our Review Policy here.